Happy Friday! It's been a long and tiring week and I have even found blogging hard this week - we're calling it post-Christmas-jet-lag here. Hope you have a relaxing end to the week and a restorative weekend whatever you're doing. I'm off to a book club annual meal tonight (my new book club - eek) and over the weekend I'm going to help hubs minimise his wardrobe - his idea not mine! 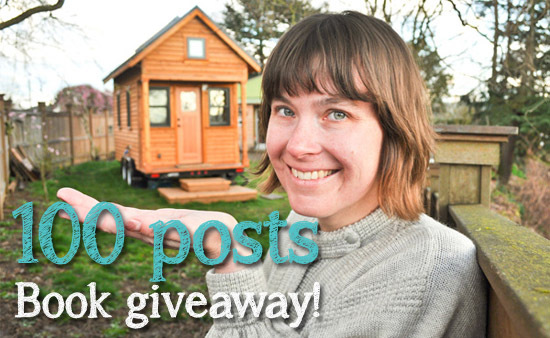 I'm leaving you a link to some new photos from Tammy Strobel's tiny house - great inspiration for decluttering. And just a reminder that my giveaway of Tammy's book You Can Buy Happiness (and It's Cheap) closes on Tuesday. Just leave a comment here or after the original post if you're interested. Hello Claire! Count me in, if I'm not counted in already (oh, maybe I already am. oops). anyway, I'd love to read the book. Hope you have a great weekend. Mine will be spent doing some decluttering for a new project I've joined! I'm sure I could have written a book with the same title! We have been in our tiny house for 8 months now, and I'm still wondering where I can push the walls out! In my neck of the woods (San Francisco Bay Area) our 1750 sq. foot home is considered small!! Tammy's little house is amazing. What a fab book to win and start using in 2013. I sometimes struggle to make time to blog. It took me ages to realise that I didn't have to post daily, the world wouldn't stop turning if i skipped a week! I aim for every other day which feels manageable. I hope your weekend is giving you the chanced to relax and catch your breath!